Japanese Tea Story : Can Be a Gateway to Tea-Leaf Tea!? Can Be a Gateway to Tea-Leaf Tea!? According to the Japan Soft Drink Association, the output of green tea drinks in 2015 has increased four years in a row. Which means about 6% increase from the previous year. Does this mean that Japanese drink more green tea??? The answer is...yes and no…. ", I think. "Green tea drink" here refers to mainly bottled one. 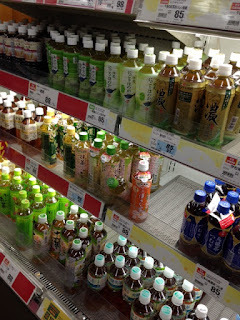 Bottled tea is everywhere, and very popular. But not tea-leaf tea. Bottled tea is often served on the dinner table at home. But not tea made by kyusu. Many green tea shops and tea places in Japan now are full of tourists from overseas rather than Japanese. It is what it is. Can you make a decision now? ?